Shirley and Lee were a teenaged duo who had a string of R&B and pop hits during the 1950s and early ‘60s, becoming known as “The Sweethearts Of The Blues” and establishing a style which critics have seen as influencing later musical developments in ska and reggae. 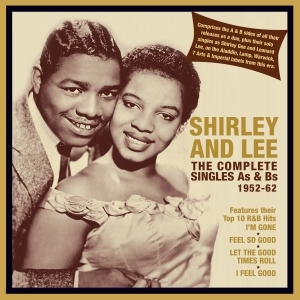 Shirley Goodman and Leonard Lee were both born in 1936, and a 1950 demo made by Shirley made its way to Eddie Messner of Aladdin Records, who teamed her with Lee to record as a duo under the name of Shirley and Lee - their debut single “I’m Gone” was an R&B No. 2 hit in 1952. This great-value 62-track 2-CD set comprises the A & B sides of all their releases as a duo, plus their solo singles as Shirley Gee and Leonard Lee, on the Aladdin, Lamp, Warwick, 7 Arts & Imperial labels during this era. It features es all their eight career R&B and pop hits as a duo, including the 1956 R&B No. 1 “Let The Good Times Roll” and the other R&B Top 10 entries “I’m Gone”, “Feel So Good” and “I Feel Good”. It’s a comprehensive overview of their career in this line-up and an entertaining showcase for their distinctive and influential style.